Salannka's Muses: New Garden, New Business happening Yay! New Garden, New Business happening Yay! This is going to be a quickie!!! Wow the thoughts that statement conjures up!! Just wanted to quickly pop in and update all news on the Western Front - HOME that is!! But it is 0230 and I am exhausted and want to pop off to bed. 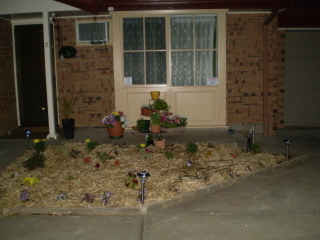 However for my dear friend in the US - you know who you are - I just wanted to post some piccies of my progressive front garden I have put in in last few weeks! Along with that I have been busy getting together final costs and answering a few of my own questions about my new business "The Office Realm Beyond"- my work as a Virtual Assistant. 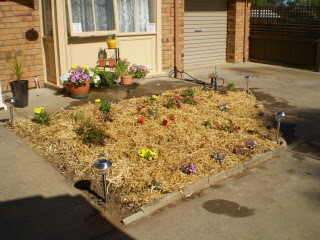 So to my dear friend in the US here are my piccies of my garden, and I will come back later today and get more done! My Wine Style – yummmmmm! What my business is all about and what I do! Christmas and 2008 around the corner!